The Dodgers and Padres played in San Diego on Thursday night. Cody Bellinger led off the top of the fourth for the Dodgers in a scoreless game and hit a dribbler in front of the plate. The ball was fielded by catcher Austin Hedges who fired wide of first base and the ball got away. It appeared that the Dodgers had a runner on first base with no outs. But plate umpire Jordan Baker ruled that Bellinger interfered with first baseman Eric Hosmer’s ability to field the throw. Dodgers’ manager Dave Roberts made his obligatory argument and the game resumed. One thing is predictable every season in the game of baseball. You can bet the house that there will be numerous arguments and ejections centered around the batter-runner interference rule the last 45-feet between home and first base. Nothing is new, just the names change. The frequency of the infraction is so common, I could do weekly updates. It probably is the most violated, least understood rule in the game. The purpose of the RUNNER’S LANE is simply to protect the fielder taking the throw. The call is very subjective. If the plate umpire (or first base ump) judge that the batter-runner, being out of the LANE did not interfere with the fielder taking the throw, no interference is called. And no interference is called when the defensive team retires the batter-runner, regardless where the batter-runner is running. This sends mixed signals to the players. If the batter-runner remains in the LANE, he is protected unless he intentionally interferes. In that wild, game-ending play on Tuesday night involving Alex Bregman and A’s catcher Jonathan Lucroy, Bregman was hit by Lucroy’s throw but he was protected because he was in the RUNNER’s LANE. 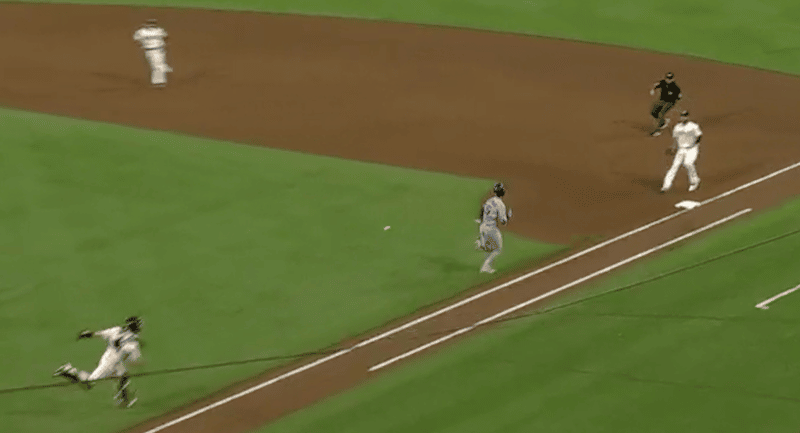 The errant throw allowed the winning run to score for the Astros. The rule is certainly open to criticism in its current design. But until (if ever) it is changed, it might be a good idea to follow the rule which basically says, if the batter-runner has one or both feet outside of the 45-foot long, 3-foot wide RUNNER’S LANE, at any time, and in the judgment of the umpire interferes with the fielder taking the throw, the batter-runner shall be called out. The batter-runner is permitted to exit the 3-foot lane by means of a step, stride, reach or slide in the immediate vicinity of first base for the sole purpose of touching the base. When the rule is invoked, all runners are returned to the base they occupied at the time of the pitch. The rule normally comes alive when the throw is made by the catcher or the pitcher from the bunt area on the first base side. This is when the batter-runner needs to remain in the RUNNER’s LANE. If the batter-runner is attempting to leg-out an infield hit anywhere else in the infield, chances of a batter-runner interference call are greatly reduced and running out of the LANE is not as critical. There is no doubt that the rule creates a disadvantage for right-handed batters because they need to shift into the RUNNER’S LANE which slows their arrival to first base. BUT IT IS THE RULE. Hey, I don’t like paying taxes-but it’s a rule! Several years ago, Derek Jeter was called out for violating this rule at Fenway Park. He was running out of the LANE and was hit by catcher Doug Mirabelli’s throw. The two runners who crossed the plate on the play, were returned to the base they occupied at the start of play. In my opinion, Mirabelli intentionally threw at Jeter to induce the call. A few days later I asked Jeter if he would take the same route tonight and run the risk of being called out? Lousy rule or not, it is what it is. Numerous rallies every year go up in smoke because of ignorance of the rule or just plain stubbornness to adjust. And who knows how many games have been lost because of this. Don’t turn a blind eye to 5.09 (a) (11). This is not rocket science. My suggestion is that managers and coaches should be leaders in demanding that their players FOLLOW THE RULE. And broadcasters, as messengers of the game, should master the rule to provide a creditable interpretation for their viewers and listeners. In the following two plays, the batter-runner was running out of the RUNNER’s Lane the entire distance between home and first base as did Bellinger. When the plate umpire sees that, there is virtually a 100% chance that the batter-runner will be called out if he is not retired. The Rangers’ Carlos Tocci was called out for batter-runner interference in the second inning of the Rangers-Tigers game at Comerica on July 8. The call led to the ejection of Rangers’ manager Jeff Banister by plate umpire Chris Segal. In the second game of the July 9 double header between the Phillies and Mets at Citi Field, the Phils’ Cesar Hernandez was called out for batter-runner interference in the top of the fourth inning after he was hit in the back by the throw of Mets catcher Kevin Plawecki. Notice how the title to the link is incorrectly written as, “Hernandez out for running out of baseline.” THE RUNNER’S LANE IS NOT A BASELINE. It is a “recommended area” for the batter-runner to run in when there is a play being made on him at first base, especially from the bunt area on the first base side. The batter-runner is not required to run in the LANE, but if he doesn’t run in the LANE, he runs the risk of being called out for interference. A quality throw is necessary. But the word I’m getting is, if the batter-runner is running out of the LANE the entire distance, he most likely will be called out regardless of the quality of the throw. I would suggest that more time be spent educating the players on all levels about this rule. We are talking wins and losses here. The manager’s argument with the umpire also sends mixed signals to the players that they have done nothing wrong. The rule can use some changes. Perhaps the MLB Players Association can lobby for it. For starters, maybe the RUNNER’s LANE can start the last 30-feet instead of the last 45-feet. This will give right-handed batters more time (60-feet) to conform to the rule and get into the LANE. To help sell the call, some managers instruct their catchers to throw at the batter-runner if he is running out of the lane. It’s possible in the above play, this is what Plawecki did. Do you want your players to be a target of a catcher’s throw? Do you want to risk losing games because a rally was aborted because the batter-runner was called out for interference? If your coaching philosophy is to have the batter-runner run out of the LANE to create a more difficult throw, you can continue to do so. But you are rolling the dice and, in my opinion, the risks clearly outweigh the rewards. The players should abandon a bad habit and FOLLOW THE RULE!